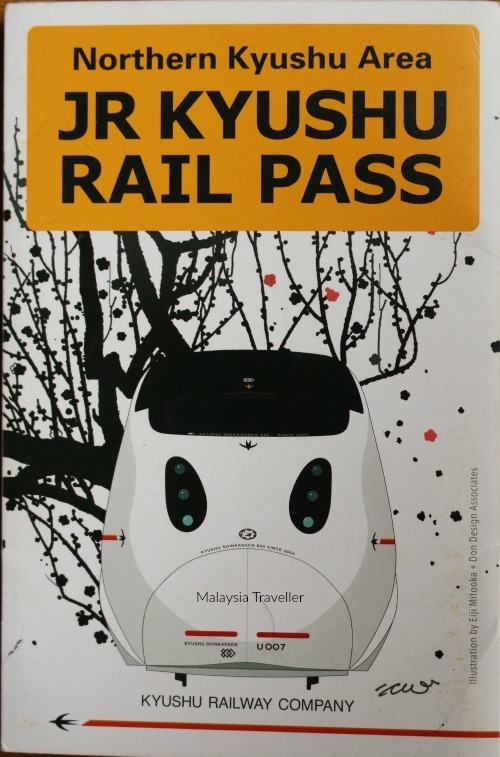 The JR Kyushu Rail Pass allows visitors to Japan from overseas unlimited use of Japan Railways (JR) trains to visit tourist hot spots in Kyushu in a cost-effective way. If you are planning to travel around by train in Kyushu for three consecutive days or longer you should definitely get a Rail Pass. Map showing the area covered by the Northern Kyushu Pass. What are the types of Rail Pass available? 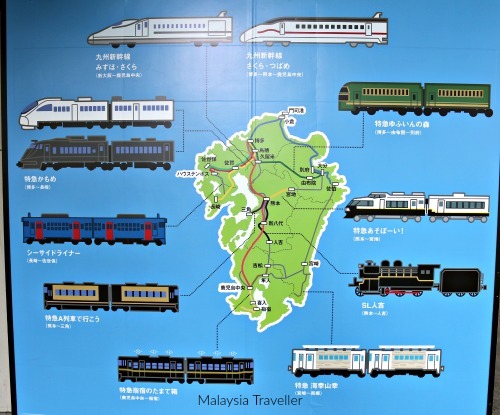 There is the All Kyushu Area Pass which offers unlimited rides over the whole island of Kyushu, there is the Northern Kyushu Area Pass covering the north of the island only and a Southern Kyushu Area Pass covering only the southern half. 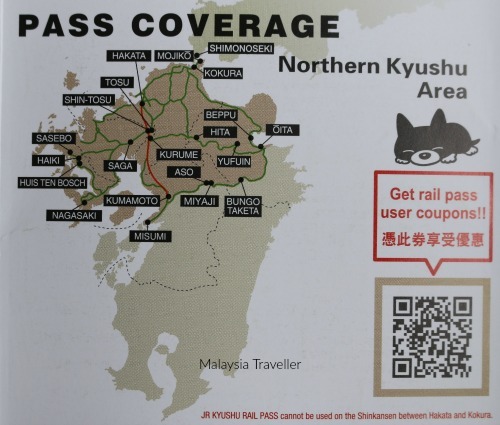 There are numerous other passes covering different parts of the country, including a Nationwide Pass covering the whole of Japan but for the purposes of this article I am concentrating on the Northern Kyushu Area Pass only. Who Can Use a JR Rail Pass? To be eligible you must be an international tourist or temporary visitor, which will be evidenced by a short-term stay stamp in your passport on arrival in Japan. Japanese citizens and foreigners living or working in Japan are not normally eligible to use a JR Rail Pass. It used to be that you could only buy a Rail Pass before arrival in Japan but now, with online purchasing, it is possible to buy an E-ticket and exchange this for the Rail Pass at the ticketing office in Japan. 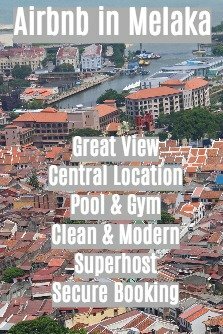 If you live in Malaysia like me, you could go to a JTB Malaysia office (main office is in the Amoda Building on Jalan Imbi opposite Berjaya Times Square). You need to bring along passports for each family member. 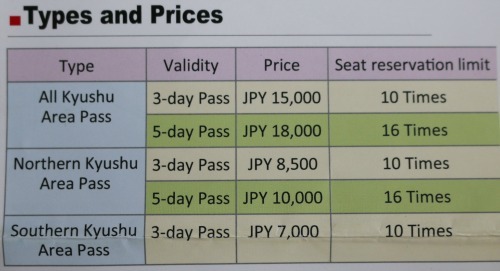 I bought 5 Day North Kyushu Passes costing MYR 390 per adult which is roughly the Ringgit equivalent of JPY 10,000. They issued me with official vouchers which I exchanged for the actual Rail Passes after arrival in Japan. The JTB office is also a good place to collect brochures and get advice on places to go from the knowledgeable staff. I just went to the JR Rail Pass counter in Hakata Station (the main railway station in Fukuoka City) where English-speaking staff assisted me and the actual passes were issued efficiently. Again you need to bring your passports to prove that you are eligible, together with the vouchers. The issued pass bears the name and passport number of the individual. You have to specify the date on which you want the pass to start. The 3 days or 5 days, depending on which pass you have purchased, will run consecutively from the start date. 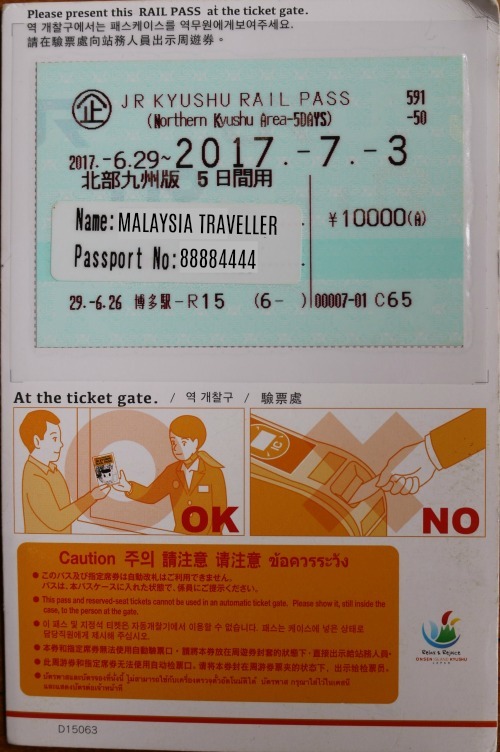 The above 5-day pass started on 29 June and expired at midnight on 3rd July 2017. Once you have the Rail Pass, travel is easy-peasy. You can immediately use the same JR Rail Pass counter at Hakata to book your first trip. 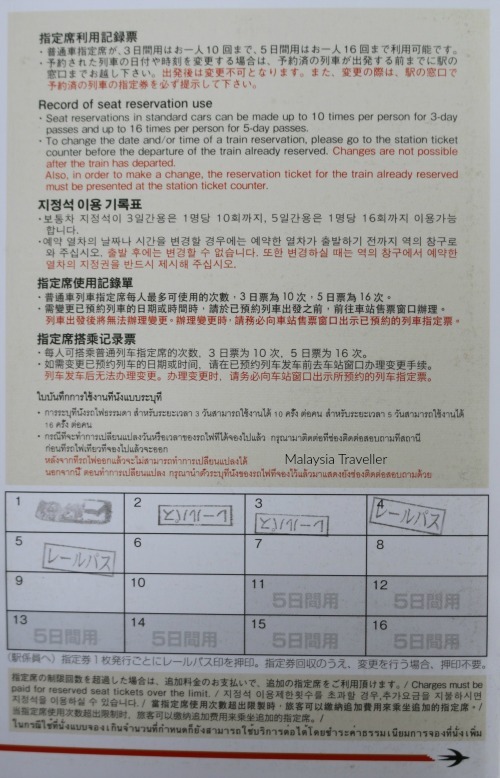 The English speaking staff (probably also Chinese and Korean speaking since that is where most of the tourists in Kyushu seem to come from) will note down when and where you want to go and then you go to the ticket counter where the tickets will be issued. It is best to reserve seats to ensure that you and your party are sitting together. This is done at the time of issuing the ticket at no additional cost. You are allowed to make seat reservations 10 times per person for a 3-day pass and up to 16 times for a 5-day pass which is more than enough. They stamp your rail pass each time they make a reservation. Refer to JR Kyushu Railway Company’s FAQs for clarification. 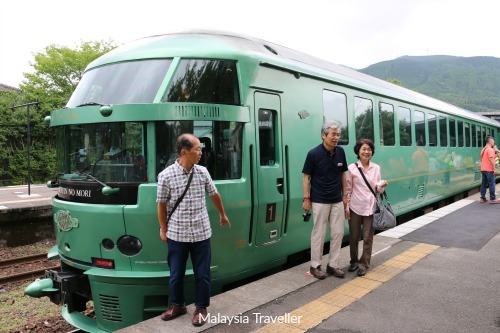 Jaoan is a train-lover's paradise with dozens of special trains to enjoy. You need to use the train every day to make good use of the Rail Pass. The regular fare for the Shinkansen (Bullet Train) from Hakata to Kumamoto and back with reserved seating is over ¥10,000 which is the same as the cost of a 5-day pass so in one trip alone you would have recouped the cost of the pass. The Yufuin no Mori train to Yufuin only runs 3 times a day. You have to make a reservation ahead. With the Northern Area Kyushu Pass it is possible to take a circular route around Northern Kyushu taking in the sights at Beppu, Mt Aso, Kumamoto and Nagasaki while staying at a different hotel every night. If you are an organised person and travel without too much baggage this would be the best way to see Northern Kyushu with your Rail Pass. 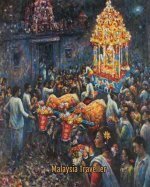 However, if like my family, you don’t like packing and unpacking every day, and are not keen on lugging heavy suitcases around on trains you could consider doing a series of days trips from Fukuoka instead so that you can just stay in one hotel in Fukuoka and travel without any baggage. That is what we did with our 5-day pass, making 5 different day trips. 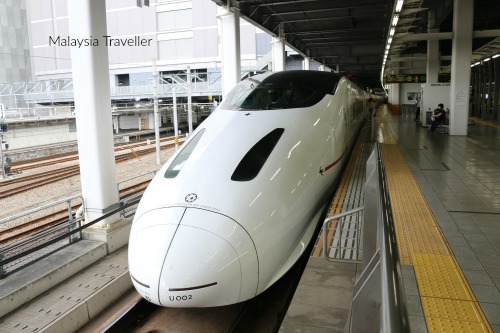 You can use your Northern Kyushu Area JR Kyushu Rail Pass to ride the Shinkansen (bullet train) as far as Kumamoto from Hakata. 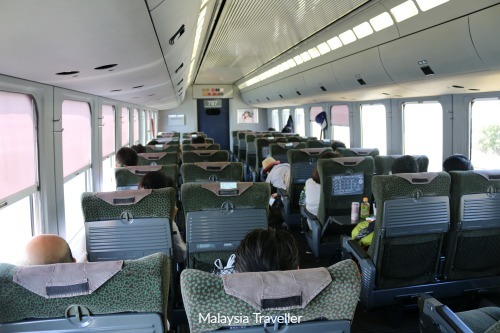 With your JR Kyushu Rail Pass you can just sit back and enjoy the ride.